In the ballad, she sings, "Mama, I'm so sorry I'm not sober anymore / And Daddy please forgive me for the drinks spilled on the floor"
In this June 13, 2018, file photo, Demi Lovato performs on stage at The SSE Hydro in Glasgow, Scotland. The video is mostly a lyric video but does show photos and videos of Lovato as a child and adult, including a photo of her holding a red cup. 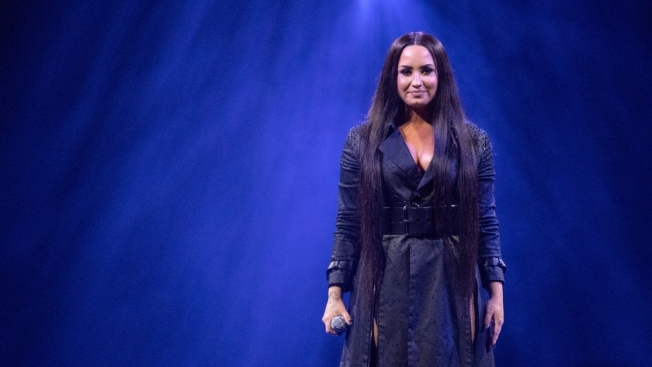 Lovato got tearful onstage at a concert in March after celebrating her six years of sobriety milestone. In April, she celebrated Hayley Kiyoko's new album being released with fellow former Disney Channel stars Cole Sprouse, Matthew Scott Montgomery, Debby Ryan and Alyson Stoner. Photos of the reunion went viral, and among them was a photo of Lovato holding a drink, spurring fans to question what she was drinking.